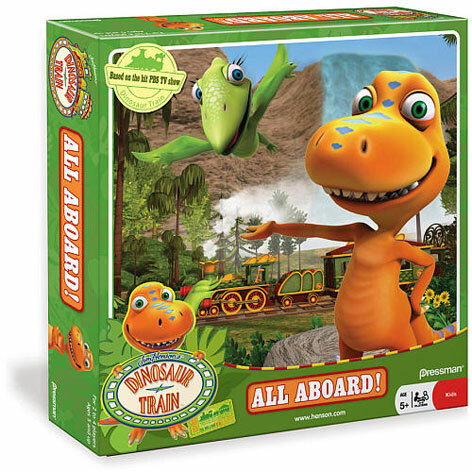 In October 2009, Pressman Toy Corporation announced that they were teaming up with The Jim Henson Company to produce a series of board games inspired by the children’s animated show, Dinosaur Train. The All Aboard! game is a particularly good example of how well the show translates into the traditional board game format. Recommended for children aged 5-7 and featuring all the main Dinosaur Train characters including Buddy, Cory, Don, Shiny, Tiny and Tank, All Aboard! draws on many of the educational aspects of the show. The aim of the game is for the players to follow a path through the three ages of dinosaurs - Triassic, Jurassic and Cretaceous – and win the game by being the first to reach the nest. How many spaces each player can progress at a time is dictated by Mr. Conductor. Landing on Stopwatch spaces allow you to move closer to the finish but you must beware of the Dinosaur Crossing spaces because these will move you back towards where you started! The All Aboard! Dinosaur Train game can be played by 2-6 players and comes complete with 6 movers (+ stands), a spinning wheel, the main game area and instructions. We can't pretend that there’s anything particularly revolutionary about this board game as it follows a fairly tried-and-tested format for games aimed for this age group. Nevertheless, we’re sure that young fans of the show will enjoy it all the same. Please tell us what you think of the Dinosaur Train All Aboard Game by Dinosaur Train.